With the midterm election five days away, Ohio Secretary of State Jon Husted, the GOP candidate for Lt. Governor, spoke to local Republicans Thursday in Greenville. 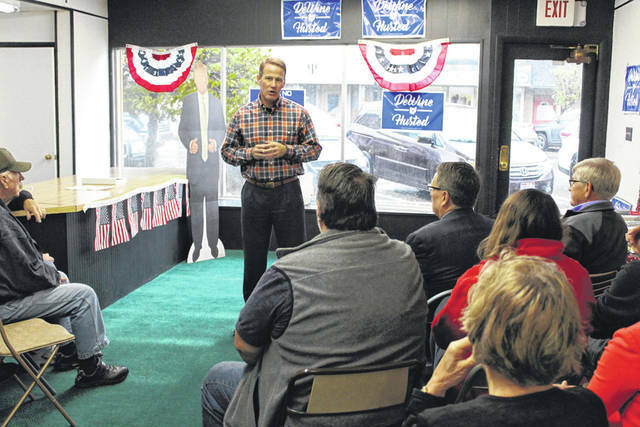 GREENVILLE — With the Nov. 6 midterm election rapidly approaching, Ohio Secretary of State Jon Husted, the GOP candidate for Lt. Governor, visited Greenville Thursday, seeking to rally local Republicans to get out the vote. Husted is running with current Ohio Attorney General and former U.S. Sen. Mike DeWine, who is seeking to fill the seat of outgoing Republican Gov. John Kasich. DeWine and Husted are facing off in a closely contested race against the Democratic ticket of Richard Cordray and Betty Sutton. Husted characterized this year’s race as “super close,” comparing it to the 2010 midterm election. Husted said Ohio’s improved economy and lower unemployment can be credited to the leadership of Kasich and other Republicans in Columbus. “We’re moving in the right direction. Why would we want to go back?” he said. Husted said Cordray is planning $4 billion in new spending, saying the Democrat’s spending plan would cost each Ohio household “more than $3,000” in higher taxes over the course of four years. “Mike DeWine and I simply believe that you would make better decisions with their money in your pocket than we will in Columbus,” he said. Husted also spoke out against Issue 1, the statewide ballot initiative that would lessen criminal penalties on many drug offenses in the state. When asked if he would seek to return to Ohio’s municipalities all or some of Gov. Kasich’s so-called “Rainy Day Fund” — now estimated at more than $2.7 billion — Husted said he and DeWine hoped to return as many tax dollars as they could to local communities, as needed, to promote infrastructure, schools and drug education. Despite the well-publicized and ongoing animosity between Kasich and President Donald Trump, each is planning campaign stops in Ohio to support the DeWine/Husted ticket. “Electing Mike DeWine governor is the only thing that John Kasich and Donald Trump actually agree on,” Husted said. This entry was tagged election, Governor, Greenville, Jon Husted, Mike DeWine, Richard Cordray. Bookmark the permalink.